REL Acoustics T-7 review | What Hi-Fi? REL's new T-7 subwoofer is an appealing product. It's compact, decently made and not afraid to go loud. Push the volume levels northward and it stays firmly in charge and impressively composed for one so small. Unlike most of its rival designs, REL has chosen to go the passive radiator route with this design instead of the more commonly seen reflex port. In theory both approaches to bass tuning should yield similar results, yet the passive radiator route allows greater scope for fine-tuning the performance. REL has made it work well in this product. 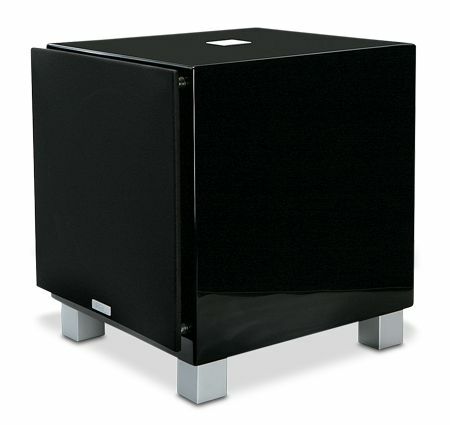 The T-7 is essentially a 30cm cube, but the combination of 20cm downward-firing driver, a 200 watt class AB amplifier and forward-facing passive unit means the sub can deliver generous doses of low frequencies when required. REL is particularly proud of how its products perform through their speaker level inputs, and we can understand why - the T-7 sounds bolder and more informative when wired this way. Yet, even when connected through the line-level option, the subwoofer's poise and insight stays much in evidence. The T-7 sounds right at home, whether adding a dose of heft to the large-scale action scenes of Inception or just dialling in a firmer foundation to the likes of Kate Bush's subtle, but rather lovely, Snowflake. No matter the source material, the T-7 remains agile and informative, and able to deliver really low notes without fudging the bass frequencies above. By the highest standards, the definition of the leading edge of notes is a touch soft, which robs the sound of a little punch and precision. And it's this shortcoming that stops the T-7 from storming this class. That said, if you're looking for a smart and capable subwoofer that's also on the compact side, this REL is well worth a look.